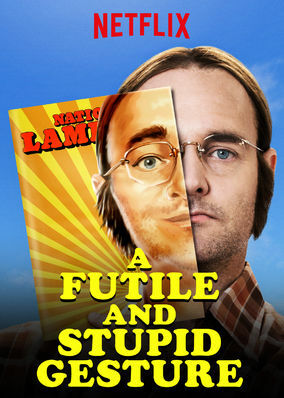 A Futile and Stupid Gesture (2018) on Netflix Costa Rica. Check worldwide Netflix availability! If A Futile and Stupid Gesture isn't available in your country, or you are visiting a country where it isn't, there is still a way to watch it! In a brief life full of triumph and failure, "National Lampoon" co-founder Doug Kenney built a comedy empire, molding pop culture in the 1970s. He went to Harvard, but lived outside the system. And his biggest risk redefined comedy in America forever.